Asaba, the Delta State capital city comes alive today as the countdown to the 21st African Athletics Championships, enters its home stretch with the opening of the Stephen Keshi Stadium venue of the African athletics show piece billed for August 1-5. The commissioning will be preceded with the Africa tour an event that will see elite athletes from Nigerian, Ghana, Botswana, South Africa, Kenya, Gambia, Mauritius and others compete to test run the facilities. Work on the Stadium named after one of Nigeria’s renowned soccer legend, Late Stephen Keshi was started during the tenure of governor James Ibori, but progress was stalled until two years ago, when Delta State accepted to host the African Championships, saving Nigerian an embarrassment. Lagos State the original host was foot-dragging. 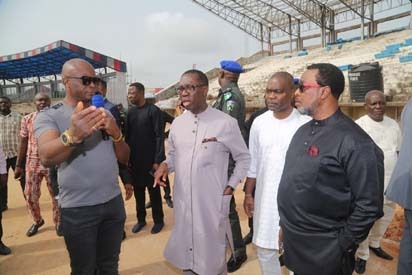 Governor Okowa mobilised local contractors, and with the assistance of Chinese expatriates, work moved on a rapid pace leading to today’s opening event. The Chairman of the CAA Asaba 2018 LOC, Chief Solomon Ogba expressed gratitude to everyone that has helped made the Delta State and Nigeria dream a reality. Ogba thanked the laborers, cleaners, artisans, and others who worked tirelessly to help put up a structure which not only met the deadline set but will surely remain as a legacy for several years down the line.